The village war memorial in the centre of Quorn, Leicestershire lists 78 men who had some connection with the village and who died in the Great War. The attached information is from Sue Templeman whose book ‘For your tomorrow’ meticulously reconstructs their lives. Sue has found evidence that three men were Methodists, although none of them appear to have been baptised in the Wesleyan or UMFC chapels. Albert Henry Burton had been a member of the Wesleyan Sunday School, and was remembered in a memorial service in the Wesleyan Chapel. Silas Stevenson came from a Methodist family, and was engaged to a young lady, Emma Teagle, who is known to have attended the Wesleyan chapel. Albert Henry Wright is described as a worshipper at the Wesleyan chapel and was remembered in a memorial service in the chapel. Additional thanks to Jonathan Capewell (re Silas Stevenson) and Gill Wright (re Albert Henry Wright). 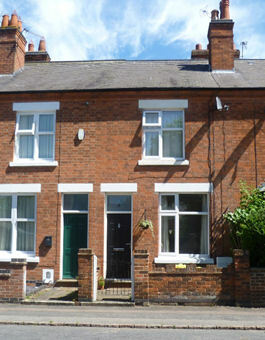 Albert Burton was born in Quorn and lived at 7 Farnham Street, with his parents Joseph Burton and Sarah Burton (née Wilmore). He was the second son of seven children. 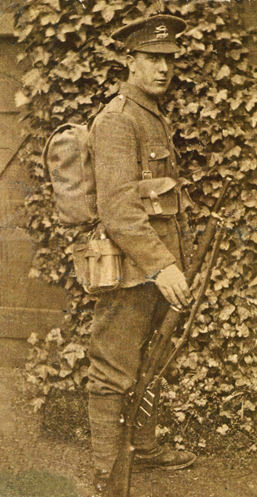 When he left school, Albert initially went into domestic service, but immediately prior to enlisting in February 1915, he was working at Wright’s factory in the village. 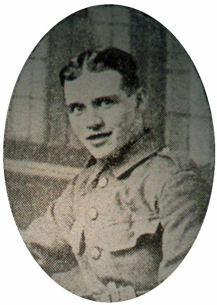 The beloved son of Mr and Mrs J Burton of Farnham Street, Quorn, who was killed in action April 27th 1917, aged 22 years. And now he rests in peace. 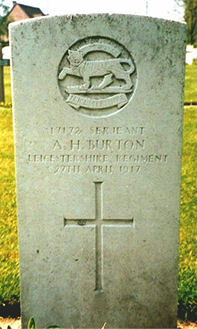 BURTON – Sergt A H Burton, 1st Leicesters, killed in action by a shell on April 27th 1917, aged 22 years. Will love you most in death. Ernest was just one year older than Albert, and Albert’s death must have hit him very hard. The Parish Church also held a service the following week and reported it in the Quorn Parish Magazine in June 1917. Albert was buried in St. Patrick’s Cemetery near Loos in France. In later years, Albert’s father Joseph was considered to be quite a character in the village. He was known as ‘Warrior Burton’, due to his exceptional Army service. In 1948, the Loughborough Echo reported that he had joined the Leicestershire Regiment in April 1885, and won the Burma Medal. 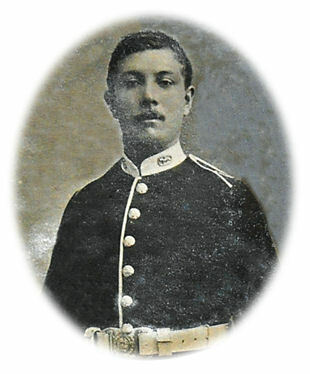 He fought in the Boer War, and in 1914, at the age of 52, he joined the Royal Defence Corps. In 1948 he was 86 years old, and described as ‘Quorn’s oldest soldier’. Silas Stevenson was born in Quorn in 1887, one of at least nine children of William and Catherine Stevenson. The family went to the Methodist Chapel and the 1901 census shows them living in ‘New Quorn’; an area which included the square made by Sarson Street, Castledine Street, Barrow Road and Loughborough Road. Further research has shown they lived at what is now 9 Sarson Street. (See picture under the entry for George Pollard). Silas’s father died in 1905 when Silas was 17, and shortly afterwards in 1908, he joined the Leicestershire Regiment as a regular soldier. Although his Army attestation form shows that he was a farm labourer, he was of slight build, only 5 feet 4 inches tall and weighing less than 9 stones. Silas was 28 years old when he was killed. His body was buried at Serre Road Cemetery No. 2 in France. His effects were sent to his mother (Catherine or Kate), who had remarried, and was now Mrs Gifford and living at 29 Selbourne Street, Loughborough. At the time of his death, Silas was engaged to Emma Teagle, who also lived in the village. In 1921 his grieving mother had a mourning plaque made from a photograph of Silas in dress uniform, his medals and his cap badge. When Albert was born in Melton Mowbray in 1892, childbirth was significantly more risky for a mother than it is today. Albert was the first child of Henry James Wright and Maria Wright (née Clarke), and tragically Maria died of ‘childbed fever’ (puerperal fever), nine days after Albert’s birth. It is not known who Albert lived with in his very early years, but although his 39 year old father married 26 year old Alice Richardson eight years later in 1900, the 1901 census records the nine year old Albert living with his grandparents, in Melton Mowbray. Moving forward ten years, the 1911 census shows Albert living with his aunt and uncle, (his father’s sister and brother-in-law), Isaiah and Mary Ann Pell, and their three children, in one of a row of small cottages on Alma Terrace, just off Meeting Street (now demolished). It would also appear that his two young half-brothers; George William Stanley Wright aged 8 and Frederick Cyril Wright aged 7, were living there too. It must have been very crowded with eight people in the small ‘two up, two down’ cottage. When Albert was 21, he married 19 year old Elsie Hyman from Barrow Road, in Quorn Church, on the 23rd February 1913. His occupation was recorded as a ‘shoe hand’. The couple moved to Castledine Street and had two children; Nora in 1913 and Charles Albert Henry in 1916. After war broke out Albert joined the Leicestershire Regiment (7th Battalion), and like so many others, found himself fighting on the Western Front. He died on the 14th July 1916, but his body was never recovered. His young wife was informed that he was missing when she was expecting their second child. Baby Charles was born in October 1916 and named Charles Albert Henry after his father, but it was not until he was 9 months old, in July 1917, that his father’s death was finally confirmed. 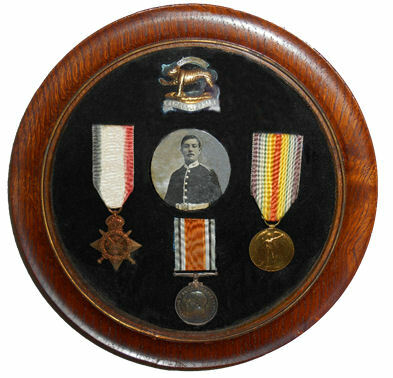 After the war Albert was awarded three medals; the 1914–15 Star, the British War Medal and the Victory Medal. These were the three most commonly awarded campaign medals in WW1, and most of Quorn’s soldiers would have received either two or all three of them. They were often referred to (and still are), as Pip, Squeak and Wilfred. The 1914–15 Star was awarded to British and Imperial forces who served in any theatre of the War between 5th August 1914 and 31st December 1915 (other than those who had already qualified for the very similar 1914 Star). This medal was never awarded on its own, and recipients would also be entitled to the British War Medal and the Victory Medal. The British War Medal, 1914-18 (silver) was awarded to British and Imperial forces who had served between 5th August 1914 and 11th November 1918 and entered an active theatre of war. Over 6,500,000 of these medals were issued. The Victory Medal was a UK bronze medal issued to all those who received the 1914 Star or the 1914-15 Star, and to most of those who were awarded the British War Medal. These photographs of the medals are the actual ones awarded to Albert and are engraved with his name, regiment and service number. They were sent to Elsie, who looked after them, and eventually passed them on to her children. They remain in the Wright family today. Albert’s name appears on the Thiepval Memorial in France.